The combined research team of the High Field Magnet Laboratory and the FELIX laboratory has observed magnetoquantum oscillations at THz frequencies in a doped semiconductor. Those results have been obtained by measuring the transmission of free electron laser radiation through a InSb sample in magnetic fields up to 33 T. Most remarkably, at frequencies above 0.9 THz, when the radiation period is shorter than the electronic scattering time, an anomalously high transmission is observed that can be interpreted as carrier localization at high frequencies. These findings have been reported in Physical Review Letters on October 6th, 2017. Modern electronic devices, such as Si-based processors and memories in computers, work at several GHz, while THz electronics is contemplated for devices made from graphene. From a fundamental point of view THz experiments represent a new electronic AC conductivity regime, since the typical electron scattering rates become comparable to the excitation frequencies. 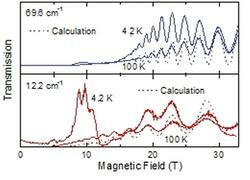 To study this new transport regime, THz magneto-transmission experiments have been performed on the doped semiconductor InSb in magnetic fields up to 33 T, using the free electron laser FLARE (Figure 1). Figure 1 : Schematic overview of the experimental set-up. THz magneto-transmission experiments have been performed on the doped semiconductor InSb in magnetic fields up to 33 T, using the free electron laser FLARE. 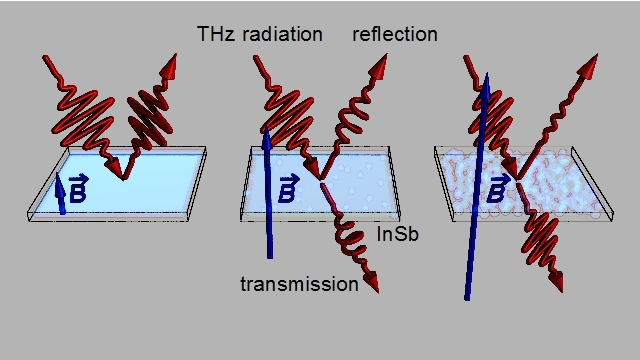 The THz transmission shows a rich magnetic field dependence (see figures 2 and 3). Figure 2 : Schematic overview of the experiment. At low magnetic fields B the InSb sample is opaque and the electron plasma (light blue) reflects the THz laser light of FLARE (left panel). With increasing field strength transparancy sets in (middle panel). At high fields, the observed transmission increases much more than expected, suggesting that the electron plasma undergoes a transition to an insulating state. Figure 3 : Solid lines correspond to the magneto-transmission of InSb for two FLARE frequencies (69.6 cm-1 and 12.2 cm-1) and two temperatures (4.2 K and 100 K). Dashed lines represent model calculations. 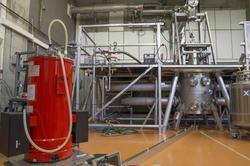 At low fields the sample is opaque, because the laser frequency is lower than the plasma frequency of the electrons in InSb. With increasing magnetic field transparency sets in and the transmission shows a rapidly varying oscillatory structure. Part of the oscillatory structure is temperature-independent and is caused by classical magneto-plasma effects (Helicon waves). However, at low temperatures (4 K) the transmitted radiation intensity shows oscillations due to the Shubnikov-de Haas magneto-quantum effect. 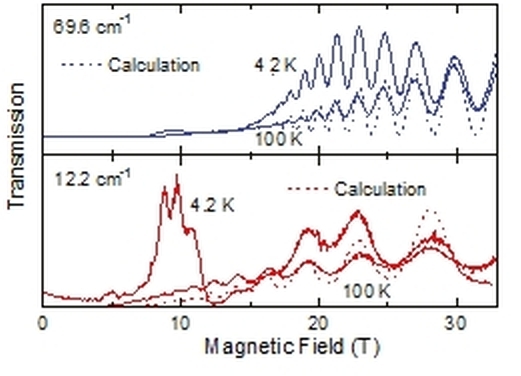 At high magnetic fields and at frequencies larger than 0.9 THz the observed transmission increases much more than expected, suggesting that the high field and high frequency magneto-resistance shows a transition to an insulating state when the measuring frequency approaches the electronic scattering rate. 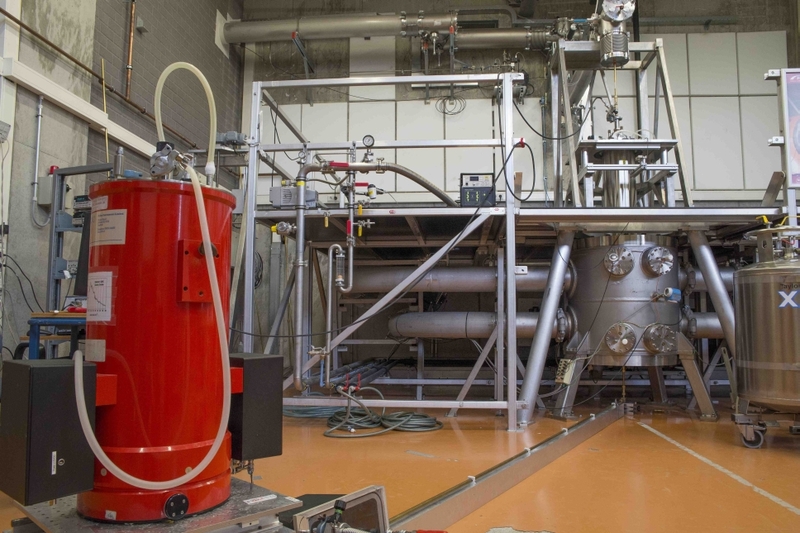 These investigations on ultrafast electronics within semiconductors profit from the enormous progress in available magnetic field strengths and advances in free electron laser based radiation sources. The results show that the unique combination of the highest magnetic fields with free electron laser radiation opens a new research area for high frequency studies in which new research questions arise and can be addressed.